As you may have noticed we have upgraded our front page to better convey Runbox’ offering and our values. We hope you like it! If you would like a simpler login screen, just click the “Simple Login” link underneath the login area (which you can then bookmark in your browser). 2014 has been an exciting year for Runbox and we’ve seen a substantial increase in popularity and growth. This has really boosted our progress — we now have several major upgrades in the pipeline, and we are very happy to be launching a new Webmail design! We’ve called the new design Runbox Aero because it’s lighter, airier, and simpler — and it makes using email a breeze! Runbox Aero is inspired by modern, state-of-the-art design, and we have listened carefully to feedback from you in order to make it both aesthetically pleasing and user-friendly. 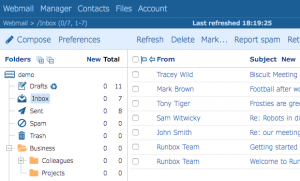 Webmail > Preferences and selecting Runbox Aero from the drop-down menu. Make sure you click Save Settings afterwards! The font face has been replaced with a larger, lighter, and more modern font. A bolder font face is available in an alternative design. The header has been shrunk to make more room for your email. All the icons have been redesigned and optimized for retina (high resolution) displays. All buttons have been enlarged and are now dark blue to make them easier to see. The sub-menus have been enlarged to make them easier to navigate. The Compose button has been moved to the far left and made more prominent. The Folder Management button has been removed — just click Folders at the top of the folder list or the Folder Management link underneath it to access the Folders screen. The Read, Unread, Flag, and Unflag buttons can now be accessed by hovering the cursor over the new Mark button. The Compose screen has been simplified to only show the most important fields. To see the BCC, Attachments, Tags, and Nicknames fields, just click “Show all fields”. We hope you like the new design, and please let us know if you have any comments or suggestions! 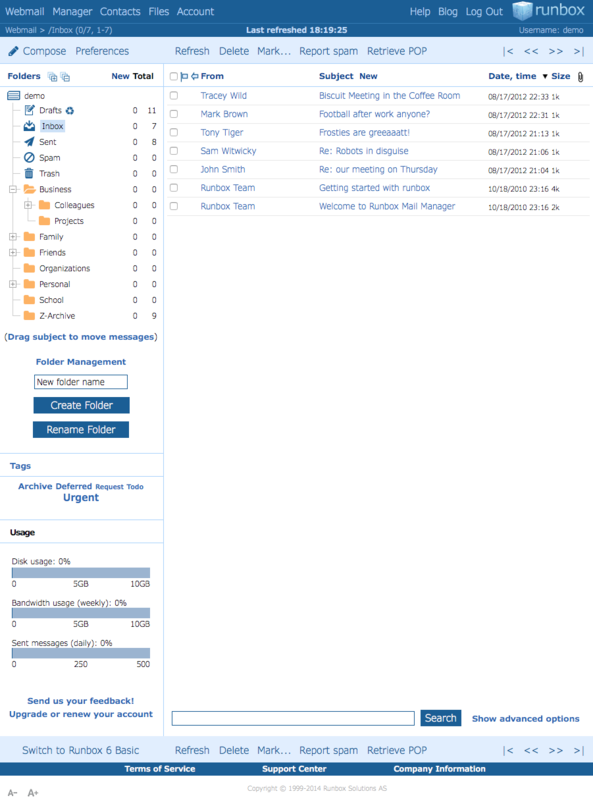 Many of our customers use message tags as an alternative to folders in order to organize and categorize their email. You can now manage your message tags by clicking Tags in the left pane in Webmail, or by going directly to https://runbox.com/mail/tags. The Tag management screen lets you add and delete tags, and get an overview of the messages that are already tagged. To add a tag to a message, just open the message, select the tag name (or [New tag] to enter a new tag name) and click “Add tag”. In order to improve the security of our email services have moved our front page to a new and upgraded server running Runbox 6 at https://runbox.com. In preparation for this we have modified Runbox 6 to redirect Runbox 5 users to the corresponding server, if your account settings indicate that you have not yet upgraded to Runbox 6. In other words, if you have been logging in at https://rmm6.runbox.com and have never clicked the “Switch to Runbox 6” button in Runbox 5, you will be redirected to Runbox 5. To continue using Runbox 6, please click “Switch to Runbox 6” at the bottom of the folder list in Webmail. In Webmail > Compose (Runbox 6 only) you now have the option to save the recipients of a message in Contacts. This option is found next to the Send button, and if checked, it will add any recipients to Contacts that aren’t already listed there. The new contacts will be saved in a separate Group called “Auto-saved” to make it easier to find them in Contacts. The next time you compose a message, the saved recipients will show up in the Groups and Contacts list to the right. They will also appear as suggested matches when you start typing in the recipient fields. Over the past year and a half we have spent a great deal of time behind the scenes upgrading the Runbox Webmail code. We have also upgraded all the underlying software that powers Runbox, and much of the hardware it runs on. This is the 6th generation of Runbox, and while it may appear similar to Runbox 5 it provides a solid and updated platform for further development of new features. In addition, we have created a software building and deployment system that will enable us to develop new code faster and more securely. 1. Tags: These let you label messages across folders, and will allow you to organize and find messages more easily. To add a tag, open an email, select [New Tag] from the Tags field near the top, enter a tag name, and click “Add tag”. You can now sort messages by your tags in the message list. 2. Improved Account overview: You can now get a full overview of your account’s Data Usage on the Account screen. 3. Sub-account management: You will now be able to manage any sub-accounts you might have in a similar way to the main account and also see detailed information about the usage of the account. Just click the sub-account address in the list after going to Sub-accounts. Note: Sub-account owners can now change the passwords of their sub-accounts and therefore potentially access them. 4. Color themes: You can now choose between 4 color themes by going to Webmail: Preferences and selecting an option from the “Theme” menu. We have also removed they gray background color from all pages to brighten things up a bit. This will take you to https://runbox.com, which is also where you will be redirected automatically next time you log in. We hope you will enjoy the new Runbox! If you have any questions, please add a comment below or open a support ticket at https://support.runbox.com. There are font size increase/decrease buttons in the lower left corner of Webmail, and these also control the font size in the Compose window in Runbox 5 Basic mode. Now we have fixed a bug so it also works in Runbox 5 Enhanced mode where the Compose screen opens in a new window. It doesn’t yet work when writing HTML messages since the HTML editor (TinyMCE) is a separate program and isn’t entirely integrated with Runbox. For more information about the different versions of Runbox, please see the Webmail Help page. The Runbox website is now protected by an Extended Validation Certificate when in secure mode at https://secure.runbox.com. This is usually indicated by a green address bar in your browser. This certificate independently verifies the identity of our company as the owner of the domain runbox.com, meaning that visitors can be certain the web pages they see are legitimate. We recommend you always be aware of the domain name shown in your browser, especially after clicking links in email messages, to prevent so-called phishing. 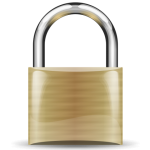 We also recommend using secure mode (SSL) when logging on to Runbox. You can enable this in your browser by clicking the “Secure” link next to the login fields on the front page.